The Institute of Physics unveils Covariance – a spectacular installation by artist Lyndall Phelps, developed through collaborative discussions with particle physicist Dr Ben Still. We talk to the pair about how art and science tackle the big questions of the universe. London’s Victorian Ice Warehouse, originally a place to store imported ice for the burgeoning ice-cream trade of the 1800s, is now home to the London Canal Museum. It is also, for the next three months, home to Covariance, a site-specific installation suspended in the building’s 30ft diameter ice well. Covariance is the fruit of nine months of conversations between artist Lyndall Phelps and particle physicist Dr Ben Still. It is the pilot project for Superposition, a series of art-science collaborations initiated and run by the Institute of Physics. 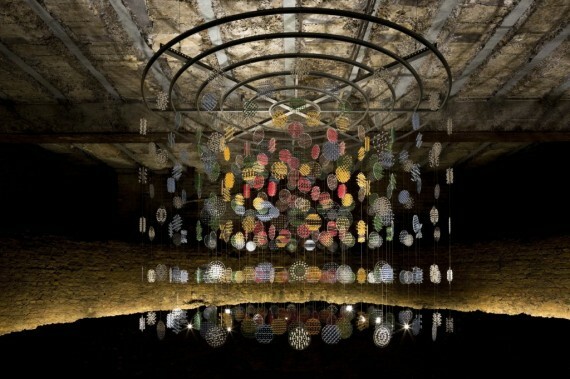 Encountering the work is instilled with a sense of adventure, as the audience is invited to descend into the well and wander between two underground spaces. Hanging from the ceiling of an inner chamber beneath the museum, a visually stunning and technically intricate circular structure is revealed. The work is made up of hundreds of acrylic discs, patterned with over 28,000 glass beads, 36,000 diamantes and 1.5km of brass rods. 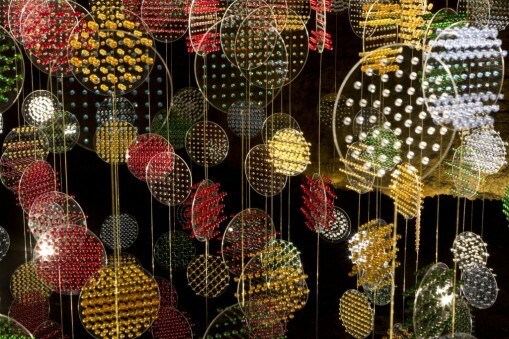 “Every piece parallels the construction of a particle,” says Still of the intricate discs that are the building blocks of the main installation. The formation of the structure is reminiscent of the mind-blowing particle detector images that Phelps discovered through Still. It is also modelled on the standard colour coding systems that particle physicists use for analysing and modelling the data they collect. While being visually light and uplifting, the work is also tightly packed with references, from female labour (that of both the artist and of female ‘computers’, the army of Cern secretaries who analysed the analogue photos taken before electronic imaging became available), the hard labour of the ice industry and, of course, the history of science – in particular the use of brass for scientific measuring instruments. The work conveys a sense of wonder that is entirely in keeping with the vast unknown that Still attempts to understand, one particle at a time. “It’s a great way of representing the detectors, but also how we represent the data nowadays,” he says. During their discussions, Phelps quickly found out about the exciting world of the particle physicist, which involves working in unusual and remote places. To perceive the elusive neutrino particle that Still researches requires isolated experiments in underground observatories. ‘This removes any interference from the showers of particles originating in deep space that constantly bombard the surface of the Earth,’ writes Still in his explanatory essay. The neutrino is thought to be key to understanding what happened directly after the Big Bang. “It’s this whole sense of the tantalising illusiveness that attracts me,” says Phelps.